Tech N9ne’s “Hostile Takeover 2012” Tour has everyone talking, including Stevie Stone. The massive tour is slated for 90 shows in 99 days, making it the longest tour in rap history. 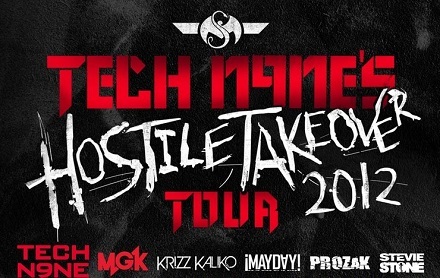 Joining Tech N9ne on the road will be Machine Gun Kelly and Strange Music’s Krizz Kaliko, ¡MAYDAY!, Prozak, and of course, Stevie Stone. With VIP packages already on sale for select dates, a clearly excited Stevie Stone hit TheRealTechN9ne.com to talk directly to the fans. The Rollin’ Stone emcee also went on to answer questions about his mixtapes and sparked a buzzworthy response from fans eager to attend the tour. As fans all around the country brace for the “Hostile Takeover 2012” Tour, VIP packages are sure to be a hot commodity – don’t get left out! Click here to purchase VIP packages for Tech N9ne’s “Hostile Takeover 2012” Tour. Will you be attending VIP?